I found a reason to buy an issue of Ultimate X-Men prior to issue 21, Shadowcat’s first appearance. Marvel Database states that this is Illyana’s first and only appearance. On her page, it states that Colossus mentions her but she doesn’t really appear. This issue shows Colossus having a blonde sister and a brunette brother; so I would understand the assumption that the blonde must be Illyana. I rechecked Marvel Database for the bulk of Ultimate X-Men issues and I don’t see her being mentioned in any of the issues that I don’t own. He also doesn’t name her in this issue. Another point, in issue 32, Colossus’ family is flown to the mansion and there, he has several siblings and I don’t recall seeing a blonde amongst them. Regardless, I’m counting it as well, until otherwise told. I read this originally in a trade, when it first came out, 13 years ago, so my memory is a bit faded – hence how I barely recall Illyana being in it. I was probably looking for her name, to make it official. So the non Colossus parts, I’m going to just use the context of the issue, to guide me through it. 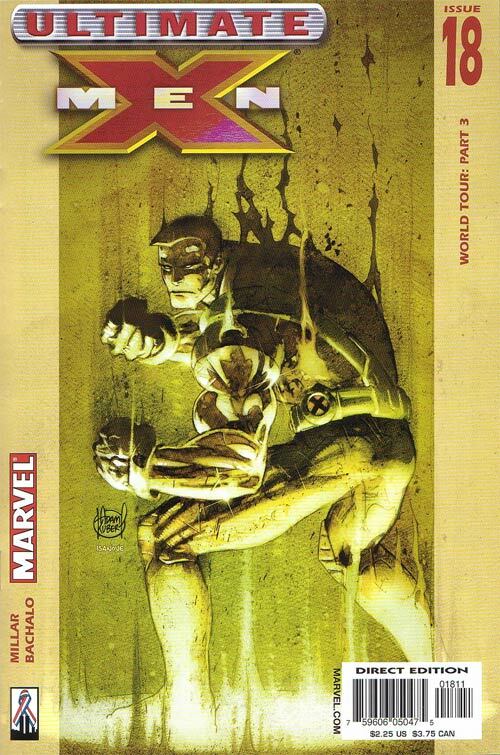 Prior to this, the World Tour title comes from Xavier’s book tour that half of the team is with him – Storm, Wolverine, Iceman and Beast. Cyclops and Jean are in Russia, trying to get Colossus back on the team. Xavier is on Muir Island, spending time with his ex-wife Moira MacTaggert. In the Ultimate Universe, Proteus is also Xavier’s son, which makes sense as an Ultimatation of a character. Proteus, being who he is, is body jumping about. STRIKE agent Betsy Braddock has been enlisted to aid the X-Men, helping her is Dai Thomas – who I must not have recognize the name of the old inspector who was annoyed by Excalibur, that is uncanny research on Millar’s part! Apparently, last issue, Proteus jumped into Wolverine’s body. Saint Petersburg : Scott and Jean are bugging Piotr, at work. 69 Russian sailors are stuck in a submarine. If Colossus isn’t willing to rejoin the X-Men, these two are trying to get him to at least save the sailors. Piotr makes the excellent point of it not being his problem. They live in the world of governments and the Ultimates, clearly Iron Man can fix the problem. Piotr is 19 years old and very practical. Stupid and jerkwad Scott throws in Piotr’s face that he only makes three dollars a week in a car factor – what a jerk! 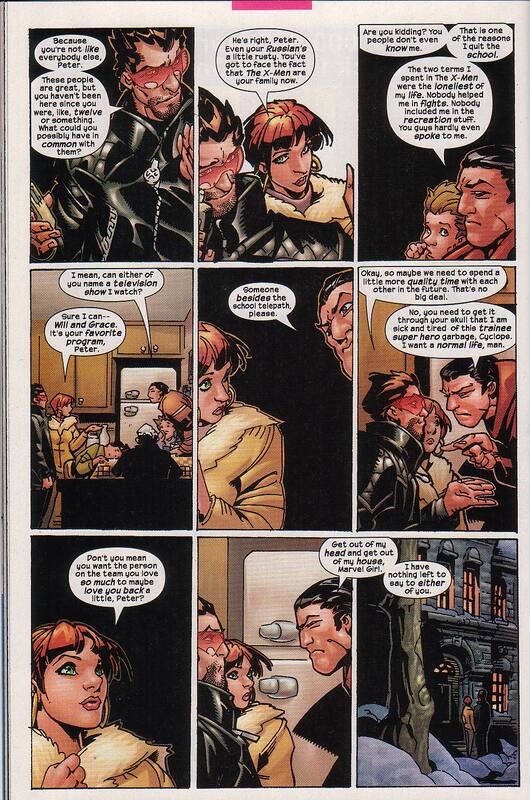 Pitor tries to make Jean and Scott feel bad by explaining to them how badly they need Xavier’s school. Jean is on the verge of going insane and Scott needs the glasses and visor that Xavier created to see. Colossus is a power that he can turn on, at will, and when he doesn’t want it, he can turn it off and look like everybody else. In London, people actually spat on them, and that was too much for Piotr. Jean tries to make an analogy about how their mutant powers are like a bird choosing not to fly. Piotr, in maybe my favorite thing any Colossus has ever said, spins the analogy around and says, “No, it is like a skunk that refuses to stink.” I wish a fourth character was there to shout, oh snap! Rasputin leaves so that he can eat dinner with his family. Berlin. Storm wishes they were sunbathing instead of chasing Xavier’s crazy son. They are at the airport to meet the new super team that Nick Fury is sending. Betsy Braddock is the psychic on the team, and she is able to track Proteus. Xavier isn’t able to as Proteus has already been inside his mind and can block him. Braddock is spending a lot of time with Xavier. Moira has realized why Proteus picked Berlin. This was the site of where Glasgow Rangers drew with Borrusia Dortmund in the European Cup in 1995 which was also the last Xavier Family Holiday. Betsy and Xavier are having a psychic conversation. She can’t believe how shaken up Wolverine is. Xavier is planning to rehabilitate his son, which surprises Betsy as she figured he was grooming his son to be an X-Man. Xavier reveals that poor Proteus has spent seven years of his nineteen years tied to a bed, which would drive anyone bonkers – to use the medical term. Xavier tells Betsy (and us) of his and Moira’s history. They were madly in love and young. After knowing each other for only three weeks, they got married. He respected her enough to get married in a kilt. Moira and him wrote the book on post-human medicine. Moira created the prototype of the giant Cerebro machine. Magneto eventually learn of their research and wanted in. Xavier grew to have a man crush on Magneto. Their human wives couldn’t compete with each other’s bright eyes and fast minds. They would talk on the phone for 72 hours on the phone. Which sounds maddening to me. I barely want to talk to people for five minutes on the phone. Magneto’s twins, who are older than Proteus – so their mutant gene kicked in before his – had no interest in talking to a flatscan. Xavier couldn’t keep watching television at night with his human family so he left to join Magneto in the South Sea. On the island, Utopia, Magneto crippled Xavier over an argument. After that, Xavier received secret funding for his school and he hired his ex-wife. She is the second best mind in genetics and he also wanted to provide for his ill son. Betsy wonders if Xavier ever feels guilty for abandoning Proteus, whose real name is David – like Legion’s – so they really are an amalgam of each other. The day after Xavier left, David’s power kicked in. Xavier doesn’t feel guilty about that, but he does regret not guiding him when he needed it most. This page ends on the worst note a father can say about a son. Xavier does love David but that love is more akin to an owner’s love for pet. It is still love but ooof, that isn’t nearly enough. Betsy just stares at him. Jean and Scott, who I can only imagine invited themselves to the Rasputin home OR just creepily followed him home. Jean updates Piotr about how the Russian government failed with the submarine and now it is up to Iron Man to save the navy men. I imagine that must be Illyana who is sucking on her thumb. Scott can’t believe Piotr isn’t more grateful for all that Xavier did for him, as he got him out of the Russian mafia. Piotr feels like they are even as he has helped Xavier plenty. Plus, he only knew Xavier for a year. It isn’t like he is Scott, who has been with him since he was a child. If Ultimate Cyclops has the same origin story, he may not. Piotr disagrees with Xavier’s decision to not kill Magneto but try to rehabilitate him. All he wants, is to stay here with his family. Scott throws in Piotr’s face, he really is a grade A jerk in these scenes, that he hasn’t spent time with his family since he was twelve – so seven years. 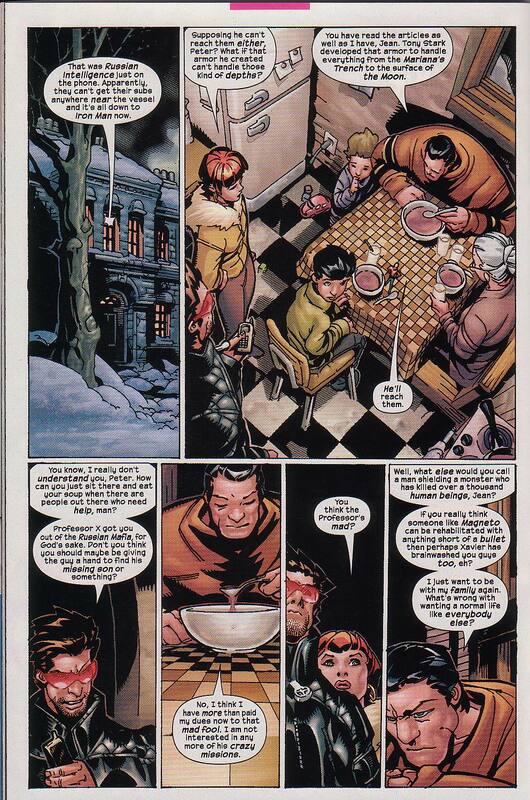 Jean tells Piotr that the X-Men are his family now, so the X-Men have the same policy as the Proper X-Men, join the team and forget your old family and friends – the X-Men are a gang. The two semesters Piotr spent at Xavier’s were the lonely of his life. He didn’t train with anyone and no one invited him to hang out, either. He quizzes the two on what his favorite show is – Jean is quick to say it is Will & Grace. Piotr doesn’t appreciate that the team telepath took the guess. I like Karen as much as the next guy, but that show really fell apart at the end. I remember being all types of angry when they cast Harry Connick Jr as Grace’s husband, as I knew even then, that he wasn’t going to join the show so the characters’ divorce was already written. Which wouldn’t happened in today’s television culture, they would have filmed all of his scenes at one moment or sign a contract to film around his schedule. Piotr doesn’t want to be a superhero, he wants to be a normal person. Jean takes this opportunity to be really inappropriate and an arse, and takes a “guess” that another reason why he doesn’t want to come back to the school is that he has a crush on a teammate who will never return his affections. He sternly tells them to leave, good for him. The news updates on the submarine situation. Iron Man is no longer available to assist as he has been called elsewhere. The newscaster essentially reports that all hope is lost. The Barents Sea : Colossus suits up, I feel bad that he doesn’t have a non-X-uniform, so he has to represent the school. He dives down and brings up the submarine. There is an ad for the various Ultimate titles. Spider-Man 22 – Green Goblin returns. Spider-Man Special 1 – All Star Artist Jam. Ultimates 5 – first mission. Marvel Team-Up 16 – Shang Chi. 18 – Colossus’ Home Turf. 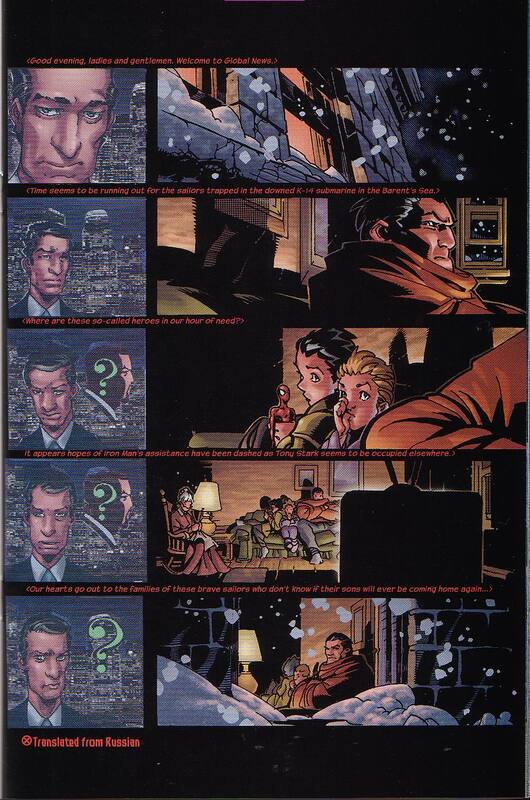 Last three pages of the issue is Xavier and Betsy talking. Colossus is back on the team and the team is meeting him at the airport. We learn that Xavier’s line about how he loves his son, was only to get a rise out of him as David is in Betsy’s mind. David is excited to have the X-Men all in one place, so he can kill Xavier’s second family. David has killed Inspector Thomas and the Ultimates were never called. Also not coming, is the other superhero team Betsy was the leader of. The issue ends with Xavier and Betsy / David knowing each other’s plan. As I don’t own the next issue but I do know that Colossus apologizes for this in issue 32 – Colossus kills Betsy / Proteus, just like how the Proper Colossus does. There is a back up feature starring Jay Leno & Spider-Man. And So It Begins . . .